We often eat frugally on our trips to save up money for other things. Breakfast each morning was in the hotels. For lunch we packed sandwiches and chips from the first nights grocery stop. This trip we used an Outback coupon for dinner and Daughter ate a kids meal the first night. It was connected to the Country Inn and Suites so very convenient. 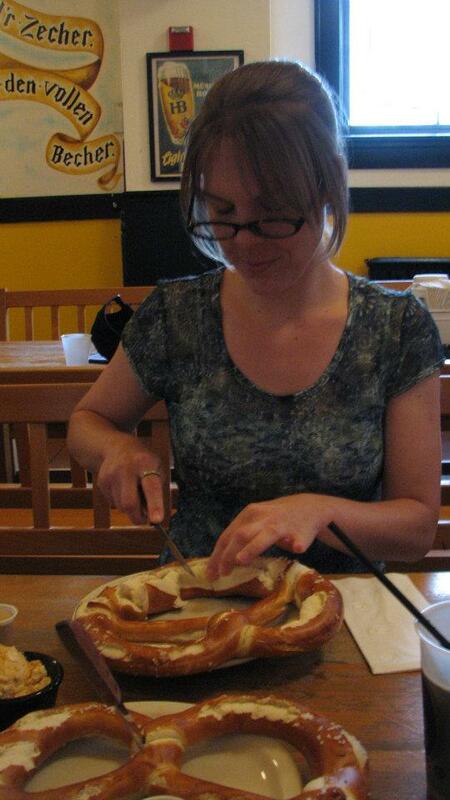 Our final night was in downtown Milwaukee, we wanted to treat my sister to some good German food. We were staying at the Hilton City Center and walked to Old World 3rd Street for our dinner. (That walk could be its own blog post, there are some interesting people in that town.) We planned to stop at Usingers but they were closed for a funeral, I wanted to purchase some sausages to take home to Husband. We love Usingers! Next I planned to hit Mader’s for dinner, I had read hit or miss reviews on Mader’s over at Tripadvisor. The food sounded great but the service sounded spotty. We definitely experienced spotty! We looked at the menu outside to ensure Aunt would enjoy the food. She found something that she would eat and we found a booth in the bar area. And we waited. The bartender would look at us, and we waited. When the waitress walked past us to the next table we figured she would come right to us. And we waited. It was very uncomfortable, even Daughter said how much longer? Then we had a discussion about should we walk up to the bartender who was looking at us and ask for service? Or do we wait? And at which point does it become borderline that if you ask for service are you asking for a spit salad? (It was an interesting conversation.) After our discussion said waitress came back and took the payment from the table next to us, never acknowledging us. And the bartender keep looking at us for the fifteen minutes so we gave up. Obviously for whatever reason we were not going to get service at Mader’s. I was irritated! I really, really wanted to try Maders. After spending our morning at the Milwaukee Public Museum we walked to the Pabst Mansion for a tour. The walk is not quite a mile and through the Marquette University campus for the most part. I had purchased a Groupon for two adult tours for $10. I had to pay for Daughters visit when we arrived. Normal prices are children 6-17 are $5 and adults are $9. $15 for a tour for 3 sounded like a good way to spend the afternoon with my Groupon. 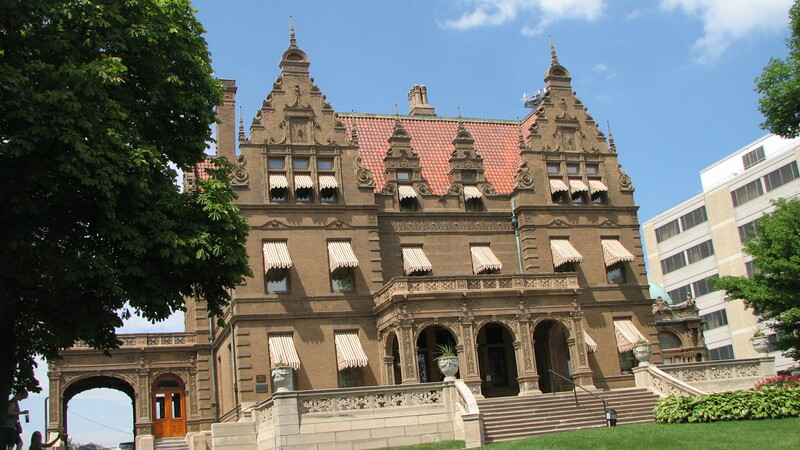 The Pabst Mansion was completed in 1892 and the family descendants sold the house in 1908 to the Roman Catholic Archdiocese. The house has been open to the public since 1978 and I would recommend any one who appreciates old homes visit the Pabst. The woodwork is outstanding and I enjoyed the little conservatory. We were a little early for the next tour so we relaxed under the big shade tree while we waited. Regular tours are offered on the hour Mon – Sat from 10-3pm and Sunday from 12-3pm. The mansion closes at 4pm. We had one final day in Wisconsin so we spent it in downtown Milwaukee. I had booked us into the Hilton Milwaukee City Center hotel and we had plans to hit the city! Naturally we parked at the hotel and walked the couple of blocks to the public museum. 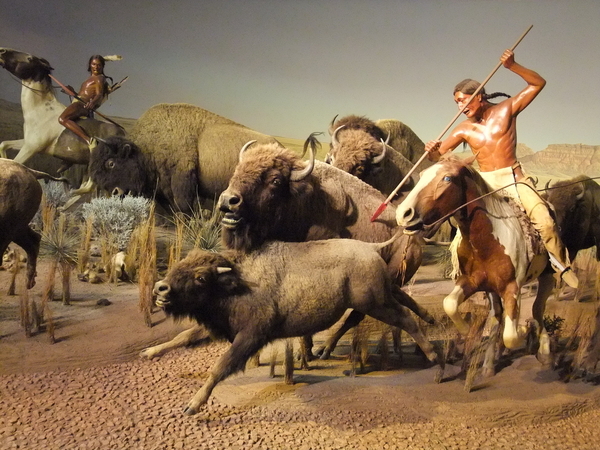 Friends of ours had told me how fun the museum is, how much their kids enjoyed it and how it was an easy walk from downtown. Having a child the same age I knew she would love this museum! We were really excited it is an ASTC member museum so we can visit for free. Unfortunately when I get together with my sister we do not always do well with details. It might be a genetic thing but for the life of us we couldn’t figure out how to heck to enter this museum. Every door we tried was locked. It was to the point of being comical, we would grab a door handle, pull, and nothing happened. Really it was just odd, we finally found a door that opened from the courtyard where people were snacking. Once we entered a very dis-interested young man finally helped us with tickets after I stared at him for 2 minutes at the ticket counter. So far not a great start as we couldn’t get in and then we couldn’t get helped with admission. This is a museum, you would think you want people to visit? On the plus side it was free with our ASTC membership (Association of Science – Technology Centers) so I did not have to pay admission for the three of us. Normal admission is $15 for adults while Children(3-12) and seniors are $11. We only visited the MPM and did not do the Dome Theater Show. Metered parking is free on Sunday on the street otherwise there is parking in a covered ramp adjacent to the museum. (Walking up like we did we missed the main entrance which is from the parking ramp.) Parking in the ramp varies from $5-$12 depending on the length of your visit. 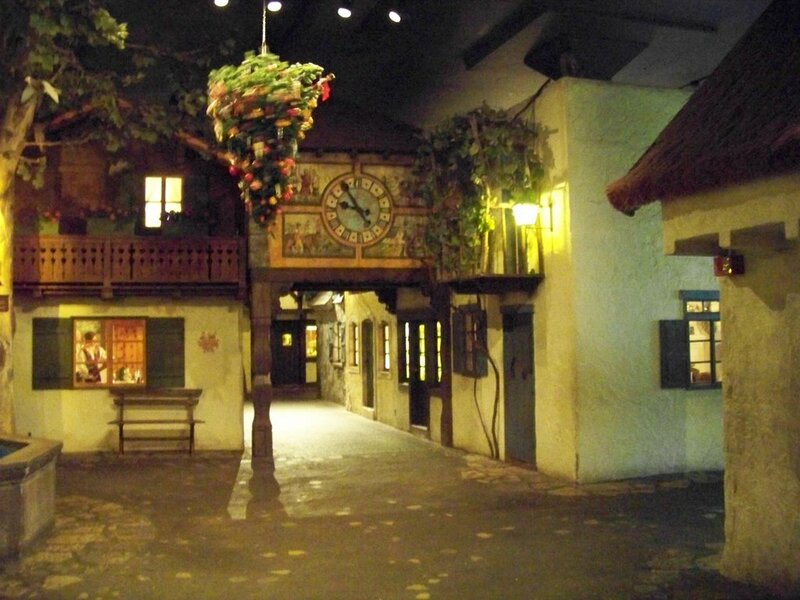 The ground floor is only the museum store, dome theater entrance and admission. Up the stairs there are three floors and amazing exhibits on everything from streets of Old Milwaukee to Africa. I have to say this museum had some of the best exhibits I had seen. We have visited a lot of museums but Milwaukee Public had incredible displays! 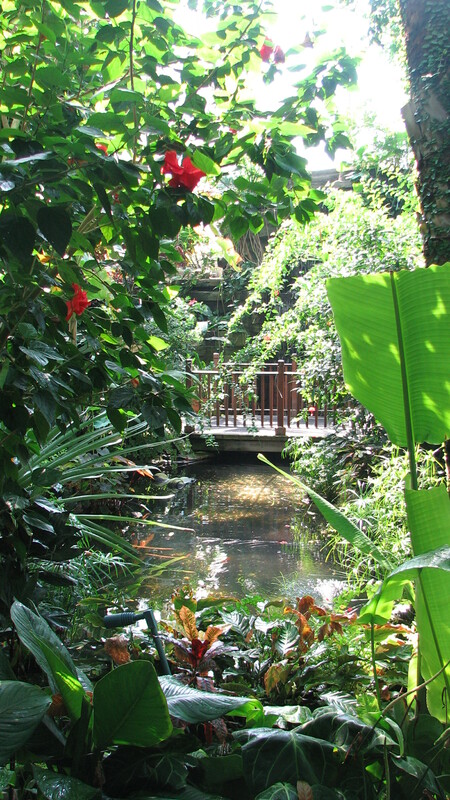 There was a replica of a European Village, Native American exhibit, Africa exhibit and a rainforest. Very impressive! We stayed at the Radisson in Menomonee Falls Wisconsin. 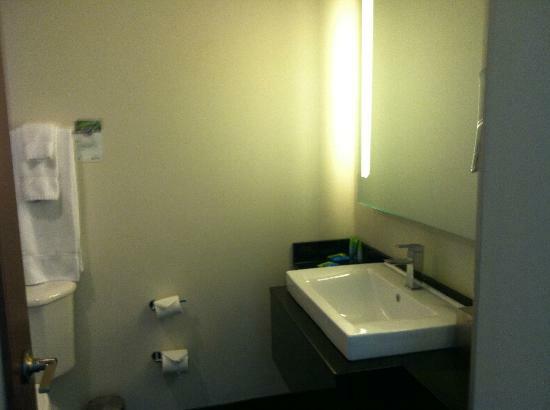 The hotel is very new with a modern vibe. We stayed here on our hare brained road trip to Milwaukee with Aunt Em. All three of us were excited to stay here, it was a nice new hotel! And we had not gotten much sleep the night before so we were looking forward to a quiet night. The hotel was nice and quiet with a large pool area with a very large hot tub. Not too many people and we were able to relax. We had a great night! The next morning was no so great. Three girls with a not user friendly bathroom setup. The very sleek and modern was coming back to bite us. #1 the shower, I love a good hot hotel shower. Its not my hot water and I love the different shower/layouts that we find in hotels. I thought this might be a nice shower, I was wrong! The shower “door” is a half glass partition. It was cold, unless you found a way to have all of you under the hot water the cold draft froze you out. And no one else could be in the bathroom. I love my sister but there was no privacy. #2 the cool sink and counter left no place to put all of our stuff. Three girls have a lot of stuff for the morning. It was a huge pain to not have counter space! See the black are around the white sink, that is what you have for counter space. So while it was a cool hotel with a decent breakfast buffet that we purchased in the restaurant I don’t think I would stay here again. It looked modern but it was not very functional for three girls. After spending the morning at Discovery World we crossed the lawn to the Milwaukee Art Museum. This building looks amazing outside! We did not get the opportunity to see the “wings” open but the building is impressive to say the least! Lunch was quick sandwiches we had stashed in a cooler in the trunk before entering the museum. We were lucky as it began to pour once we entered the museum. It was fun to watch the storm over Lake Michigan from the museum windows. Day two of our amazing adventure, or the trip to torture Aunt Em took us to the Discovery World Museum in Milwaukee. 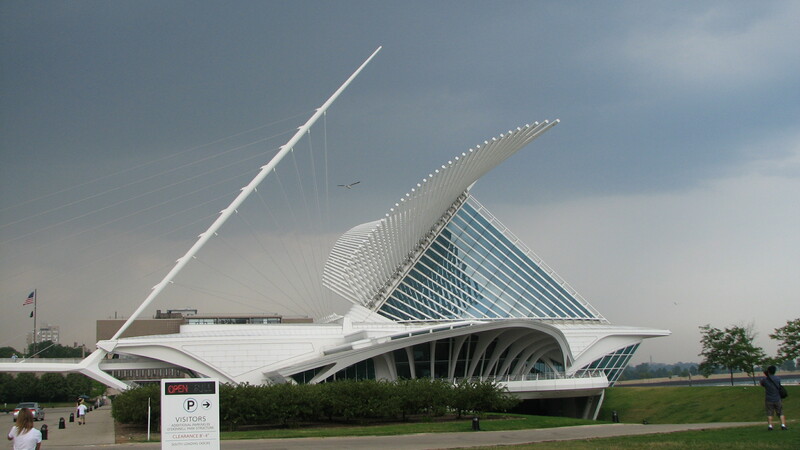 The museum is on the shore of Lake Michigan east of town and shares a green space with the Milwaukee Art Museum. We actually parked at the art museum and walked over to Discovery since we planned to finish at the art museum. For Discovery World we used our ASTC Museum pass for our admission. IF we had paid admission was $17 for adults and children 3-17 are $13. Active military is $10 for them and their family members. Parking is $8 for two to three hours or $10 for three to six hours. I had done some research online but was not sure what to really expect here but my child loved it! 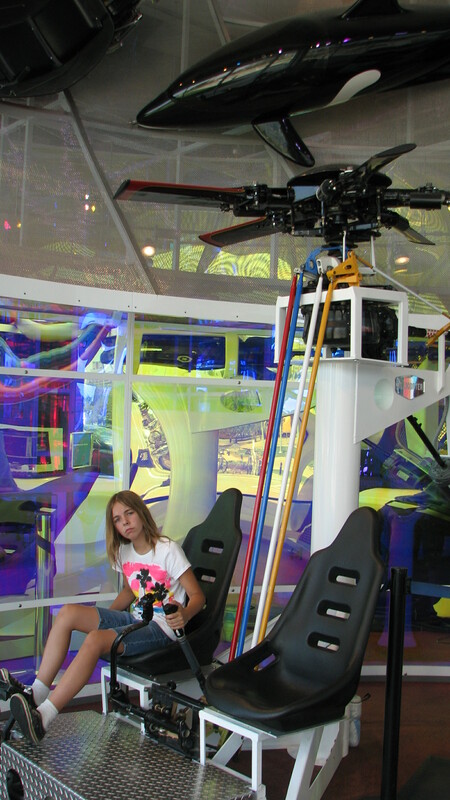 She played in the flight simulator, and with the pulleys. 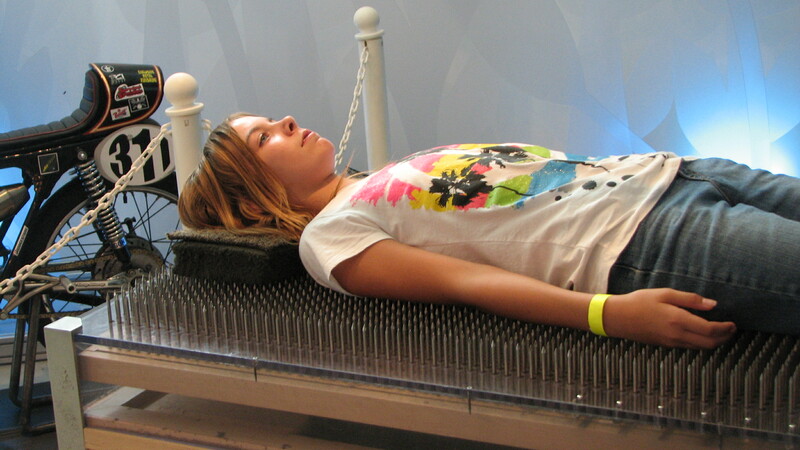 She laid on a bed of nails and tried to look serious like it hurt. After our stop at Jelly Belly Visitors Center we had a free weekend in Wisconsin. I love to sniff out places that are off the beaten path if we have time. Mitchell Park Conservatory (The Domes) is one of those places. The Domes are located to the West of Milwaukee off from I-94. 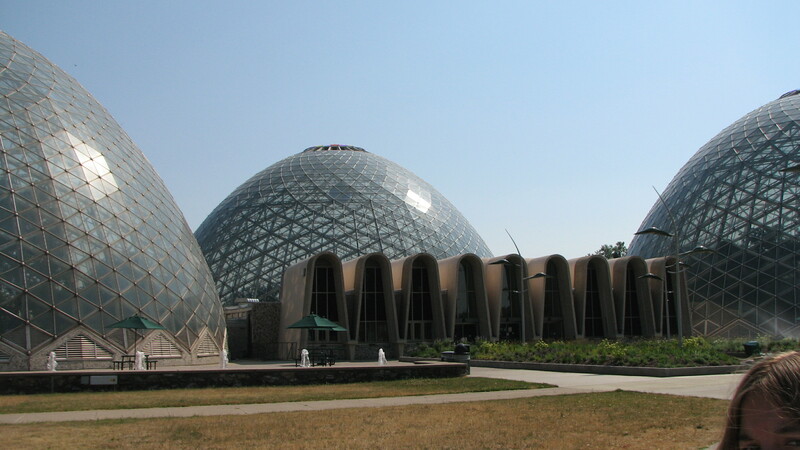 The domes were completed in 1967 and at a cost of $4.5 million. Once we found the parking area we were reminded to remove anything valuable from the car. There were signs on the front doors and I think in the parking lot. So don’t leave that GPS hanging from the windshield. As you can see there are three domes. We started in the Tropical dome. 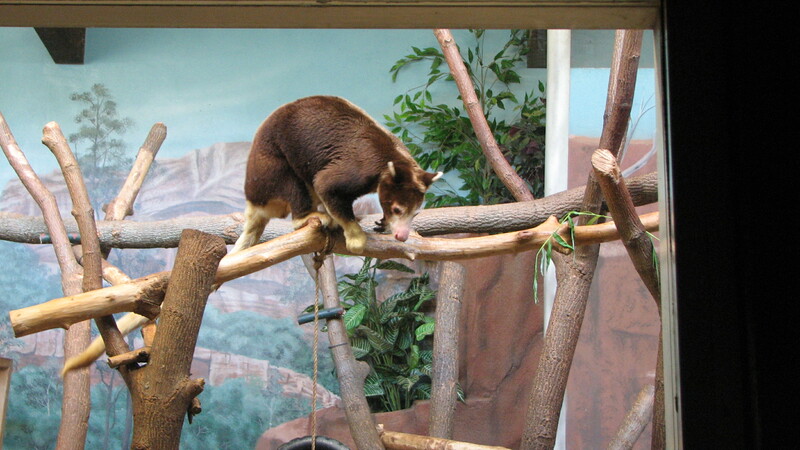 We had a zoo membership that has AZA reciprocal admission so we used the pass at the Milwaukee County Zoo. We had stopped at the Jelly Belly Visitors Center in the morning so it was around noon when we arrived at the zoo. It was hot enough that we debated even going to the zoo or waiting for the next morning to visit. Since it was supposed to rain the next day we put on our sunscreen and hit the zoo. Our admission was free for the three of us but parking was still $12. IF we had paid admission is $14.25 for adults and $11.25 for kids ages 3-12. We would have paid $51.75 for the three of us to visit the zoo, glad I paid $12. As I said it was hot, so we alternated into buildings whenever possible. 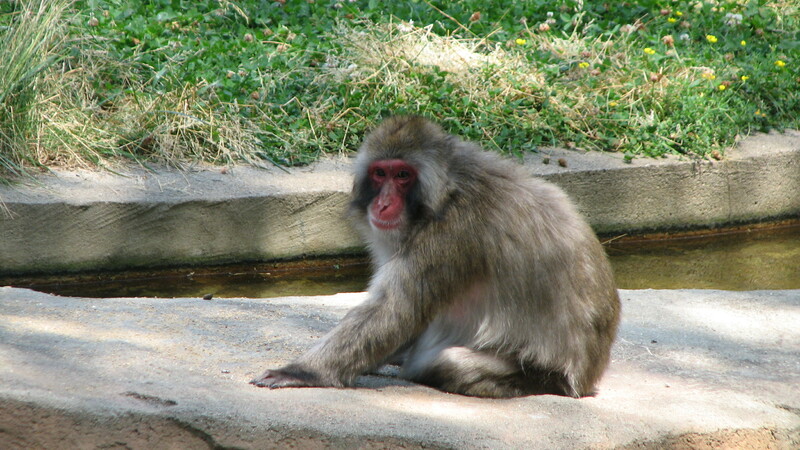 In spite of the heat the animals were very active. We stepped into buildings to break up the heat. The hippo had the right idea, we needed to cool down somehow. There was a Club Carlson promotion during our road trip, stay at a Radisson and a Country Inn and Suites you received a heap of points. I think it was 50,000 for the Radisson and 44,000 for the Country Inn and Suites stay. I was in for this one!!!!!! So for our first night stay (and 44,000 points) was Country Inn and Suites in Brookfield, Wisconsin. There is a grocery store around the corner from the hotel and an Outback Steakhouse connected to the hotel. We needed to grab groceries for lunches and then ate at the Outback. Very convenient! The hotel staff was very nice, the pool area was very nice. 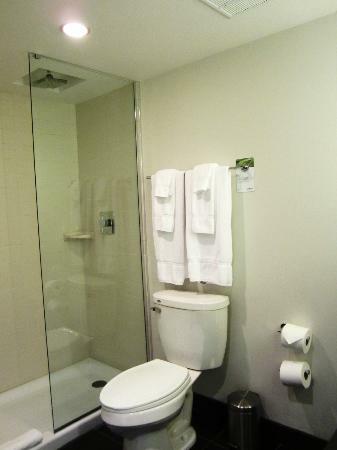 It was a great looking hotel, and even though I had read some mixed reviews I was happy with the start of the evening. Daughter swam, we went for dinner and came back to crazy town. Sports groups of boys ages 8-13 had begun to gather in mass at the hotel. I wasn’t worried, we had stayed with sports teams before. But then it went from bad to worse, the male chaperones parked themselves out on the front porch with drinks. And the youngsters were running wild in the halls and at the pool. It was crazy enough that Daughter asked to go back to the room and leave the pool area. There was no supervision that night. It was banging doors and running through the halls well past 11pm. The front desk apologized at check out when I mentioned it but I would not recommend anyone stay at this location if teams continue to use it. We survived breakfast with the young people, we ate in our room instead of trying to find a table. The stay earned me 44,000 points so that is a little comfort but it was one of our worst guest stays. 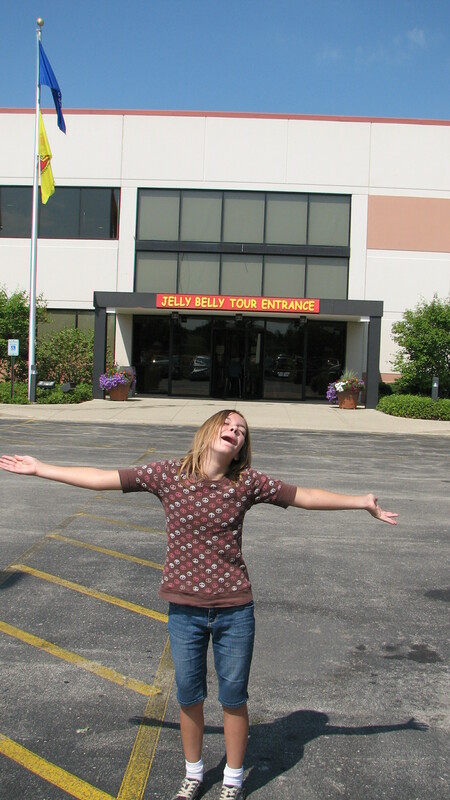 I am not 100% sure how we go the idea to visit the Jelly Belly Distribution Center in Wisconsin. I must have heard/read/seen something and when Daughter was munching thru a bag of Jelly Belly’s in the car I said “Did you know we could go there?” I say stupid stuff like that a lot and nothing ever happens. By default my phone rang right then and jokingly Daughter said “Ask Aunt Em if she want to go to Jelly Belly?” Daughter was laughing hard and thought she was being silly. Ha, Ha, jokes on her! Aunt Em having no clue what the heck is going on said Yes. So we put together a road trip to Jelly Belly and beyond. Jelly Belly has a Wisconsin Visitors Center in Pleasant Prairie, I didn’t know where that was but its about an hour from Chicago. Very easy to get to off from I-94. They offer free warehouse tours, a sample pack of Jelly Belly’s on the tour and a very large candy store. Whats not to love!!! Free tour, free candy and it’s Jelly Belly. Daughter likes to act like we drove for miles and hardly survived the trip. Or she is really, really excited to be here. Our family does what it can to save money so we can travel. This blog will be a reflection of that! I would like to share hotel and airline promotions on this blog. Also I will include trip reviews, hints and even a recipe or two. Welcome and thanks for stopping by. Fantasy Suites???? New to me!